This harness leather medicine bag accommodates ointment tubes and bottles ready for use and is a must for riders who carry multiple items efficiently and safely while on the trail. 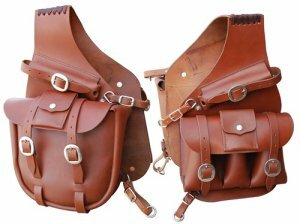 One side features 3 separate pockets, secured by a large flap and two heavy stainless steel buckles. Each of these three pockets measures 6" high x 3 1/2" wide. The opposite side has a single large pocket that measures 10" x 10" and is 3" deep. There are two interior flaps that will help keep your items secure if you are on the run and wish to forego buckling closed the main flap. Each side has an additional envelope style pocket that is easily secured with a stainless steel snap, as well as two additional tool pockets, perfect for knives.